The Stained-Glass Windows Tarot is a visually appealing creation by artist Luigi Scapini. Each card is presented in the form of an arch-shaped image inside sandstone blocks and in the luminous colors of stained glass. There are kabbalistic undertones to this deck: each of the Major Arcana cards are bordered by two Pillars, a Fiery Pillar of Severity topped with a lion on the left and an aqueous Pillar of Mercy topped with a pigeon on the right. Each of the Minor Arcana suits has its own inner border, too, of a largely abstract form chosen in colors that have an association with the appropriate element. 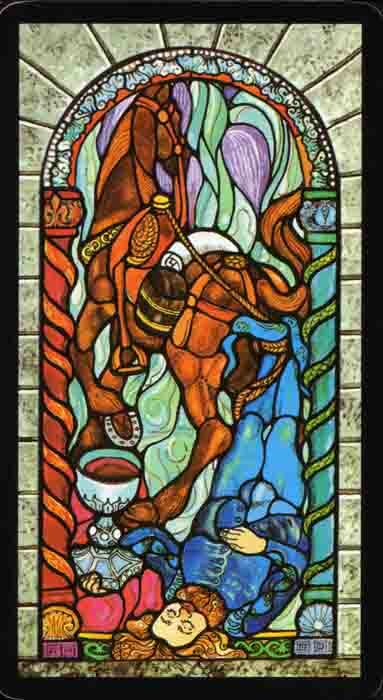 The Knight of Cups is a humorous fellow: dressed in blue, hanging upside-down behind his horse, the reins tangled around his ankles, a silly drunken expression on his face, his eyes shut and obviously half-conscious at best, but using all his personal resources to keep his Cup, brimming with red wine, upright. The steed is high-stepping carefully away from the observer, bearing a bedroll and a barrel (presumably containing more of the drink, unless he is clutching the last of it).